It’s long past time to wrap up URC Psalmody’s summer series. I head back to Geneva College in a week, and what I imagined as two or three blog posts has grown into a lengthy and multi-faceted series. That’s typical fare for this blog—so today, let me try to provide some concise closing thoughts. We began by asking this question: Why do we sing out of a Psalter Hymnal? More particularly, why do we sing both psalms and hymns in worship, yet still insist on distinguishing between the two? To help answer this question historically, I dug up several applicable documents from the early history of the Christian Reformed Church: overtures from different classes in 1928 (here and here) regarding the question of hymn-singing, the “Report on the Hymn Question” from 1930, the Foreword to the first Psalter Hymnal in 1934, and a few other sources. I found plenty of arguments for and against hymn-singing in worship (along with a fair share of weird Dutch expressions). What I didn’t find was a substantial argument on Biblical and historical grounds to justify the introduction of hymns—especially in a denomination that had gotten along fine without them since the Reformation 300 years earlier. I read plenty of reasons why hymns might be permissible in worship, but not much (other than repeated appeals to “New Testament light”) as to why they were needed. Yet after this well-placed word of caution, the committee rushes to add, “Nor does it follow that because of said danger the use of New Testament Church songs must be considered out of the question.” Just because they can be abused doesn’t mean they can’t be used properly, they suggest. Besides, they claim, the “urgent demand” for hymns in Reformed churches cannot be brushed aside as “disloyalty, spiritual weakening, and retrogression.” Once again they call attention to supposed insufficiencies in the psalms: that they speak only “in the Old Testament language of hopefully expectant prophecy, not in the New Testament language of jubilant fulfilment.” And here’s the real whopper: they turn the discussion about hymn-singing on its head by suggesting that an exclusively psalm-singing church is “guilty of neglect in properly caring for Public Worship and for the perfection of the saints, and of slighting a precious gift of the Holy Spirit.” In other words, a psalm-singing church harms its members by not allowing the singing of hymns. That’s a bold claim! In summary, the committee asked the Synod of 1930 to (1) continue the preparation of a collection of English hymns; and (2) to (attempt to) prevent psalm-singing from fading away by revising the Church Order and setting limits in place on how many hymns could be sung in a worship service. Synod more or less agreed, and the Psalter Hymnal project moved forward. That’s most of the story; for the rest of it, you can refer back to the first Psalter Hymnal’s Foreword. Got it? Does this synopsis give you an historical glimpse into the reason for the unusual wording in the URCNA’s Church Order—that the psalms “have the principal place,” but hymns “may be sung”? The relationship between psalms and hymns in North American Reformed worship is a long and complicated one. Partly it was a Dutch vs. English and European vs. American issue. Partly it was a Reformed vs. broader evangelical issue. Mostly it was an issue of biblical interpretation. And just because the CRC’s synod officially “settled” the question doesn’t mean it really went away. Eighty years ago, hymns entered the worship of a denomination that was still deeply divided over the question. That’s the heritage that’s been handed down to us in the URCNA. I can’t end without noting one additional twist, however. While the 1932 Church Order clearly stated that “the singing of the Psalms in divine worship is a requirement,” the CRC later revised their Church Order to merely state, “The consistory shall see to it that the synodically-approved Bible versions, liturgical forms, and songs are used” (Revised Church Order, 1959, Article 52b). All reference to the primacy of the Psalter was gone! With that revision in mind, it’s important—and encouraging—to note that the URCNA’s Church Order is actually a step back in the direction of principial psalm-singing. How will the URCNA’s worship change as the years go on? 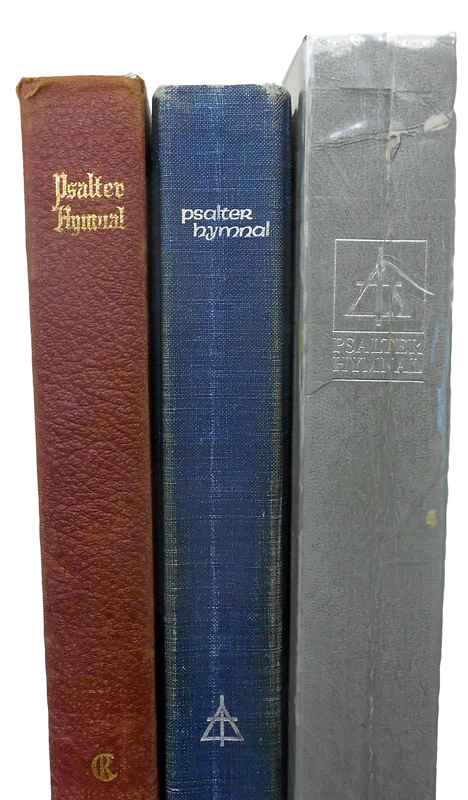 Will our new Psalter Hymnal prove to strengthen our commitment to psalm-singing or dampen it? For the answer to these questions we’ll have to wait on God, pray fervently, and work for the good of the Church. May our worship be pleasing and acceptable in his sight. [T]he introduction of Hymns for use in Public Worship was sanctioned already by our Reformed Fathers of the 16th century. For they have provided the Churches with the still existing small collection which is found in our Dutch Psalters, bearing the title ‘Eenige Gezangen,’ and from this it follows that the Hymn question cannot be a question of introducing Hymns, but only of an increase of the number that has been in use already for centuries. “As for singing in the church, the use of the psalms as rendered by Petrus Datheen shall be maintained in all the Dutch churches so that nothing less fitting and less edifying is introduced because of the variety of versions” (Articles of Wesel, 1568, Chapter II, Par. 31). “With respect to the question whether it is beneficial in addition to the Psalms of David set to poetry by Dathenus to make use of certain other spiritual songs and psalms of other scholarly persons in the [worship] of the church, the brothers decided that only the Psalms set into poetry by Dathenus shall be used, in addition to the other songs accompanying these, until this shall be differently decided by a General Synod” (Church Order of the Provincial Synod of Dordrecht, 1574, Art. XLIII). “The Psalms of David translated by Pieter Datheen shall be sung in the Christian gatherings of the Netherlands churches as has been done until now, excluding the hymns which are not found in the Bible” (Acts of the National Synod of Dordrecht, 1578, Chapter IV, Art. XXIV). “Only the Psalms of David shall be sung in the churches, omitting the hymns which are not found in the Scriptures” (Church Order of General Synod of Middelburg, 1581, Art. LI). “In the churches only the 150 Psalms of David, the ten commandments, the Lord’s Prayer, the twelve articles of faith, the Songs of Mary, Zacharias and Simeon shall be sung. Whether or not to use the hymn, ‘O God who art our Father,’ etc. is left to the freedom of the churches. All other hymns shall be kept out of the churches, and where some have already been introduced, they shall be discontinued by the most appropriate means” (Post-Acta of the National Synod of Dordrecht, 1619, Session 162). Much as I’d like to agree with the Psalter Hymnal Committee, reading these synodical stipulations leads me to a very different conclusion. Our Reformed forefathers were anything but enthusiastic about hymn-singing in public worship. In fact, they took a definite stand against “hymns which are not found in the Scriptures.” The Synod of Dort went so far as to declare that all hymns besides the “Eenige Gezangen” “shall be kept out of the churches,” and hymns currently being sung “shall be discontinued by the most appropriate means.” Their position was anything but wishy-washy! This leaves us with only two songs that are not taken from the text of Scripture and are definitely sanctioned for use in public worship. But neither the Apostles’ Creed nor the prayer before the sermon are “hymns” in the modern American sense of the word. Rather, they are standard parts of the weekly liturgy, just set to music rather than recited. Instead of speaking the Apostles’ Creed, the church would sing it. Rather than hearing a prayer before the sermon, the church would sing it. This presents a fascinating picture of congregational participation in a Reformed worship service. It’s also substantially different than singing “Blessed Assurance” in the middle of Sunday worship—and substantially different than the kind of hymn-singing the Psalter Hymnal Committee was trying to justify in 1930. What’s the point here? As I’ve emphasized before, I’m trying to restrict this series to a historical look at the creation of the first Psalter Hymnal, to see what light it can shed on the URCNA’s current Psalter Hymnal project. I haven’t even included Biblical prooftexts or theological arguments for or against psalm-singing in this post. Yet from a purely historical viewpoint, I still come away from this study disturbed—disturbed at the haste and apparent unconcern with which we supplanted the Psalter with a collection of uninspired, manmade hymns. If we decide to alter a tradition rooted in Scripture, sustained through millennia of church practice, and reinforced unequivocally by our Reformed forefathers, we had better be dead sure we are right. * It’s worth noting that the CRC’s Church Order allowed for the singing of the Morning and Evening Songs in worship by 1928. When did this change come about? I need to do more research to answer that question, too. Last week’s discussion of the creation of the CRC’s first Psalter Hymnal brought us to the Synod of 1928, the meeting at which the question of singing hymns in worship came to a head. In Dutch Reformed church government, items before the synod must first go through an “advisory” or “pre-advisory” committee which examines each communication and formulates a concise recommendation based on it. All of the overtures related to hymn-singing, including the one in favor from Classis Grand Rapids East and the one against from Classis Zeeland, were assigned to the Committee for Preadvice on Liturgical Matters. This committee brought to the synod a recommendation to adopt the overture of Classis Grand Rapids East in its entirety, change the Church Order, and appoint a committee to prepare a suitable set of hymns. Also, the committee commented, “The Synod no longer needs to appoint a committee for study, but can enter upon the matter at once” by simply adopting the Grand Rapids East overture—yes, that’s right, the same overture whose reasoning made me so uneasy back here. Anticipating opposition, they responded point-by-point (though not very thoroughly) to Classis Zeeland’s objections. (1) To appoint a Committee which shall: (a) Study this matter thoroughly from every point of view; and (b) Investigate whether or not a sufficient number of hymns suitable for our public worship is obtainable. (2) To further instruct this Committee that should a sufficient number of suitable hymns be found, the Committee shall not only submit the same to the Synod of 1930, but shall also publish its report six months in advance of that Synod, together with the text of the hymns which the Committee deems suitable. Again, we don’t know exactly where individual Christian Reformed congregations stood on the question of hymn-singing or what debates took place on the floor of Synod. But to me it still seems like a strange decision to immediately affirm the suitability of hymns for worship, yet appoint a committee to “study this matter thoroughly from every point of view” anyway, and in such a short timeframe. It’s taken the URC more than fifteen years to finish compiling a Psalter Hymnal (under different circumstances, to be sure), but the CRC expected their committee to gather a hymn section from scratch in a year and a half. Such a rush doesn’t seem to do justice to the weightiness of the question under consideration. Nevertheless, the “Committee on the Question of Hymn Singing” accomplished its task honorably, and reported to the Synod of 1930 with a hefty 133-page booklet containing (a) a response to the arguments made at Synod 1928 and an argument for the practice of hymn-singing; (b) the texts of 197 hymns; and (c) a list of revisions made to the hymns for doctrinal or poetical reasons. That booklet is available from Calvin’s Hekman Library here. Before we delve too far into the “Report on the Hymn Question,” however, there’s one argument that pops up repeatedly in the overture from Grand Rapids East, the decision of the Synod of 1928, and the opening remarks of the Hymn Committee. 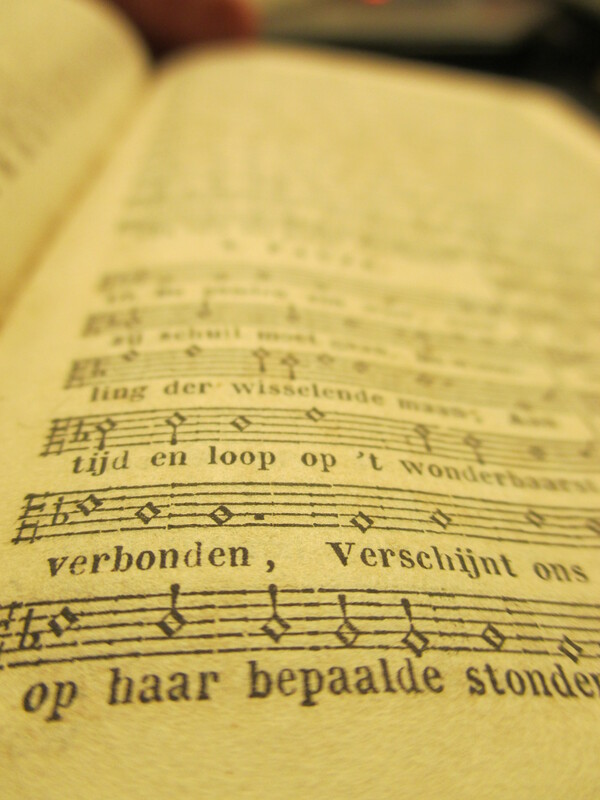 It’s an historical argument, and it runs like this: The Reformed churches could have never opposed hymns in worship on principle, since the Dutch Psalter always contained a small section of hymns (“Eenige Gezangen”) since the 1500’s. 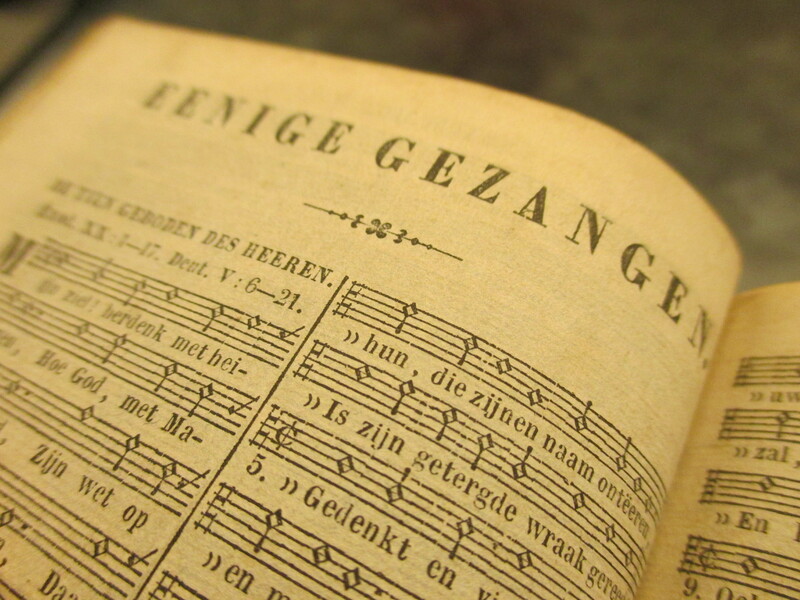 The “Eenige Gezangen” are mentioned at least nine times in the “Report on the Hymn Question.” What were these songs? Were they the same as our definition of “hymns”? How were they used in worship? Stay tuned for next week’s installment. Classis Zeeland urged synod to declare uit dat het niet wenschelijk is gezangen in onzen openbaren eeredienst in te voeren—more or less, “that it is advisable not to introduce hymns into our public worship.” When I first read this, I expected them to back up their position with some of the standard exclusive-psalmody arguments against hymns: that they are not commanded in Scripture, that they are unnecessary additions to worship, etc. But whether or not they would agree with these points, Classis Zeeland left them out, giving six other grounds for their position. Historically, the introduction of hymns tends to crowd out or even exclude the psalms from worship. Both “cold facts” and personal experience back this statement up. Where hymns are used, the frequency and vibrancy of psalm-singing often fades. Eventually, the psalms become a lonely minority amidst a broad collection of music. Even for us in the URCNA, isn’t it often true that the last third of the blue Psalter Hymnal contains the songs we know the best? Hymns speak about the life of God’s people, but the psalms speak out of the spiritual life. I think this point is clearer in Dutch, having something do with the difference between the prepositions over and uit. The classis could be talking about the fact that psalms are divinely inspired, i.e. they speak “out of the Spirit’s life,” or they might be emphasizing that the psalms are suitable for every experience of the human “spiritual life.” In any case, the point is that the faith expressed in many hymns is shallow and sentimental compared to the all-encompassing range of the psalms. Even though metrical versions of the psalms are not themselves inspired, they are still based on the inspired Word of God in a way that hymns are not. Technically, metrical versions of the psalms are no more divinely inspired than hymns. However, rhymed versions of psalm texts are still rooted in and guarded by the inspired Word of God, while with hymns, “Anything goes!” Psalm-singing helps to safeguard our worship against unbiblical teachings and themes. Many English hymns are “leavened with Arminianism” (doorzuurd met het Arminianisme). Hymns have an incredible power to spread false doctrine. To be sure, many uninspired songs are thoroughly Biblical, even staunchly Reformed, and some of the best have made it into our current Psalter Hymnal. But even in the beloved blue book, there are songs I cringe to sing. On the other hand, it’s very hard to imagine an “Arminian psalm setting,” as long as the translation and versification have been done faithfully. If the current metrical psalter fails to shed enough New Testament light on the Psalms, the remedy is not hymn-singing but better versification. Now, the classis could mean one of two things here: that the psalms should be “recast” in New Testament language (à la Isaac Watts), or that faithful translations of the psalms will automatically allow New Testament light to fall on them. For my part, I think the second of these possibilities better honors the Word of God and edifies the church. While the psalms need to be explained and connected to Christian living today—and there are many opportunities for this during the worship service—I don’t believe we can only sing psalms after they’ve been “translated” into “New Testament language.” It is the same voice of the same God speaking to us. The introduction of hymn-singing would cause unrest in the churches. To be fair, there would continue to be unrest in the CRC on this issue whether or not hymn-singing was approved. But Classis Zeeland seems to have in mind the principle the apostle Paul emphasized to the Corinthians: Even if all things are lawful for the Christian, “not all things are helpful” (I Cor. 6:12). To suddenly change a significant element of the worship service—and one that had remained basically unchanged for more than three centuries prior—would necessarily cause turmoil and upheaval in the church. How does Classis Zeeland’s overture apply to the church today? In the URCNA and the OPC, our position is significantly different than the CRC’s in 1928. Hymn-singing is a longstanding practice in our churches. The question the new Psalter Hymnal will force us to consider is not whether to sing hymns, but how to define the ongoing relationship between psalms and hymns in our worship. At the same time, though, several of Classis Zeeland’s warnings still apply very much today: the crowding out of psalm-singing, the stunting of Christians’ spiritual expression, and the spreading of false doctrine. Thankfully, there’s a simple answer we can apply right here and right now: Sing more psalms. This is the most effective way to guard against the dangers mentioned above—and along the way, our spiritual lives, both as individuals and as a church, will be strengthened.